by Brianna Crandall — August 27, 2018 — Ergotron, a global manufacturer of ergonomic digital display mounting, furniture, and mobility products, announced its continued commitment to the contract furniture market this summer with the formation of its Ergotron Contract division and the introduction of JŪV, an innovative product line of commercial grade furniture. NeoCon 2018 attendees in Chicago were the first to preview the JŪV Panel and JŪV Wall. At the show, the company received a grand award (1st place) for JŪV Wall in the 2018 Product Innovations Awards sponsored by BUILDINGS magazine. 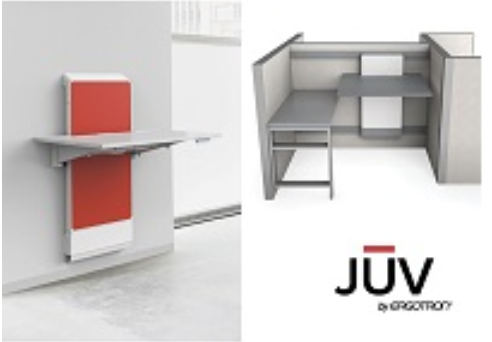 The JŪV non-electric, height-adjustable worksurface — mountable on a panel or wall — can rejuvenate new or existing space by empowering workers to move quickly and quietly from sitting to standing throughout the day, in a streamlined and organized environment. The system is designed to provide full ergonomic range according to BIFMA standards — said to be an industry first for a non-electric adjustable surface — and to transition 8-10 times faster than traditional height-adjustable tables. JŪV is the first product line for Ergotron Contract, a dedicated team inspired by mobility, flexibility and collaboration creating active environments for today’s innovative workforce and delivering holistic workspace options to realize the potential of every space. Open office layouts and collaborative spaces are becoming the new standard in new office builds and renovations, and Ergotron wants to ensure that employers don’t sacrifice wellness in the process. The JŪV line brings new energy into the workplace, not only by incorporating beautiful design but also by helping businesses address their corporate wellness objectives by integrating natural movement into their employee workspaces. With the JŪV family of products, businesses can rejuvenate otherwise unused or overlooked spaces in commercial environments. Designed with a fully concealed cable management system, users have access to power and data at their fingertips without sacrificing aesthetics. Purposefully designed with no floor supports, the line provides ample leg room and leaves space to add storage or accessories. JŪV products will be available for market deployment later this year. To learn more about the full JŪV height-adjustable worksurface line and to view a product demo video, visit the Ergotron Contract website. See how the Alias Group built its space to promote productivity October 2, 2018 In "Case Studies » HON Company (The)"
If you’re looking for a way to convert your desk to a sit-stand desk, even if it is in a corner, check this one out October 8, 2018 In "Products and Services » Furniture & Furnishings"
NeoCon 2018: Human-centered seating, even an ergonomic chair made of recycled nets — see what Humanscale has come up with July 16, 2018 In "Products and Services » Furniture & Furnishings"
NeoCon 2018: See how Herman Miller’s Gold-winning task chair fits today’s shared workspaces by instantly adjusting to a new user June 15, 2018 In "Products and Services » Furniture & Furnishings"
NeoCon 2018: Need space for desktop accessories and storage? Take a look at Teknion’s latest award-winning solutions July 9, 2018 In "Products and Services » Furniture & Furnishings"